On to day 4 of Vegan Mofo….Belgian “beef” stew. Last weekend, my wife and I harvested the first batch of Brussels sprouts from our community garden plot. In a very corny way, we felt somewhat proud carrying the stalk of sprouts back to our house. It was essentially the vegan version of bagging a buck. Seriously, look at this beauty! When we got our prize back to the kitchen, we immediately got to work “dressing” it, removing all of the leaves (de-stemmed, chopped, and stored in the freezer to be used like collard greens) and pulling the little sprouts from the stalk. 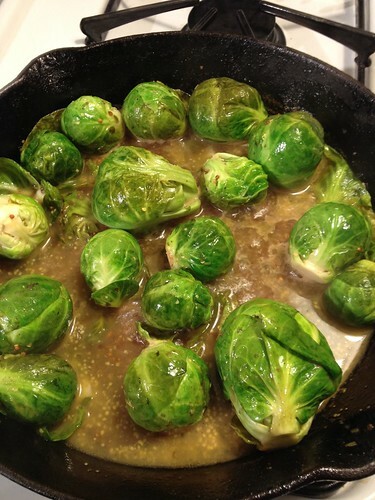 Like most people, I grew up thinking Brussels sprouts were the most disgusting thing ever created. Later in life I gave them another chance, as a vegetable among others being roasted. I was pleasantly surprised to find that I thoroughly enjoyed them and, having learned a bit more about proper preparation, have come to like them in many forms. Mix all of the wet ingredients for the seitan together and blend until smooth. Mix together the dry ingredients, then add the wet to form a ball. It should be firm, but not too firm. A little mushy, but not sticking to your hands. Heat a little oil in a cast iron Dutch oven, then cook the seitan a few minutes on each side, just enough to lightly brown. Set aside. To make the cooking broth, heat a little more oil in the Dutch oven, then saute the onion for about 15 minutes. Add the carrots and cook for 5 more minutes. Add the remaining ingredients for the cooking broth and bring to a boil. Transfer the seitan back into the broth, reduce heat to the point where the broth is barely bubbling. Partially cover the Dutch oven. Cook for 1.5 hours, flipping the seitan every 30 minutes. While the seitan is cooking, start roasting some vegetables. I used beets, rutabaga, turnips, carrots, sweet potatoes, Brussels sprouts and a head of garlic. Feel free to changes this, based on your preferences. Chop the roots into chunks, place everything into an oiled baking pan, toss with some more olive oil, lots of black pepper and a few dashes of smoked paprika. Place in the oven at 450 for about 45 minutes, or until the roots are soft. Be careful not to burn the sprouts! Once the seitan is ready, remove from the Dutch oven and let it cool. Meanwhile, mix together the ingredients from the stew sauce, add to the remaining broth, onions and carrots in the Dutch oven and blend until liquefied. Bring the stew sauce to a boil and cook for about 10 minutes. As it cooks, the alcohol will cook off and the aroma will become more pleasant. Cut the beef into large chunks (about 1″) and add to the stew sauce, along with about 2-3 cups of the roasted vegetables. Cook for a few more minutes, then serve with a nice Belgian strong dark ale. I paired this dish with a 2.5 year-old bottle of Delirium Nocturnum from my cellar, which complimented the meal perfectly. A very rich and hearty stew, with a sweet dark fruit and burnt sugar flavor. 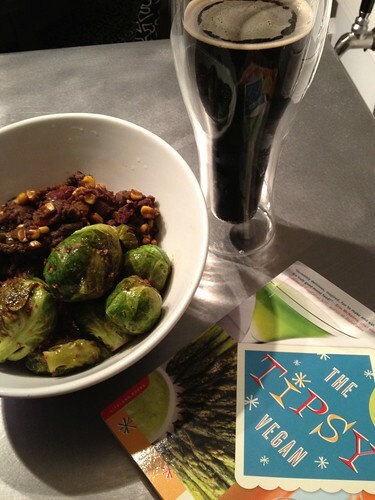 Lots of earthy, slightly bitter flavors came through with the roasted vegetables, that went nicely with the sweetness of the molasses and beer. I should point out that the recipes you will find for this stew often say to add a slice of bread with mustard on it to the meat (odd I know). Anyway, with all of the starchy vegetables, I didn’t feel it needed the bread as a binder. I did add some mustard powder to the stew sauce to get those flavors, though. I think the modified version came out great, with much more going on than the others I’ve made. Give I try – it’s worth the effort.